Today, as we near the end of the penultimate week of excavations, we come to Barrow 1 for the last time. Barrow 1, The Big One – and it is certainly living up to its name. The ditch around Barrow 1 is bigger than any of our archaeologists have ever seen before. As you can see in this picture (with a handy spade for scale), it is 5m wide and 3-4m deep. Very impressive. Another interesting aspect from this Barrow is that we can now see how the mound was formed. In this image, just to the left of the bucket you can see a brown layer of earth. This was taken from the material from the ditch surrounding the barrow and laid on top of the turves to make it higher and look more impressive in the surrounding landscape. Perhaps the sandy colour of the earth was also appealing. This barrow, and a number of others on the Heath, also take advantage of natural elevation in the ground to make the mounds prominent. These monuments were supposed to stand out. Barrow 1 has been dug by Nick Gilmore from Cambridge University, and we think he will be sad to say goodbye when we close the barrow tomorrow! Finally, one more highlight from Barrow 19 today. 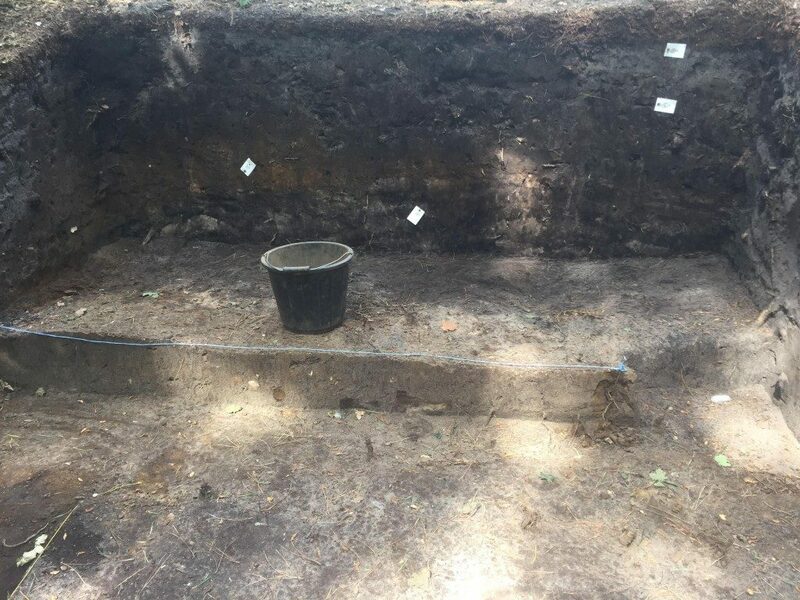 Barrow 19 has already revealed two urns to us, with the possibility of one more to come, but today the team found something else. 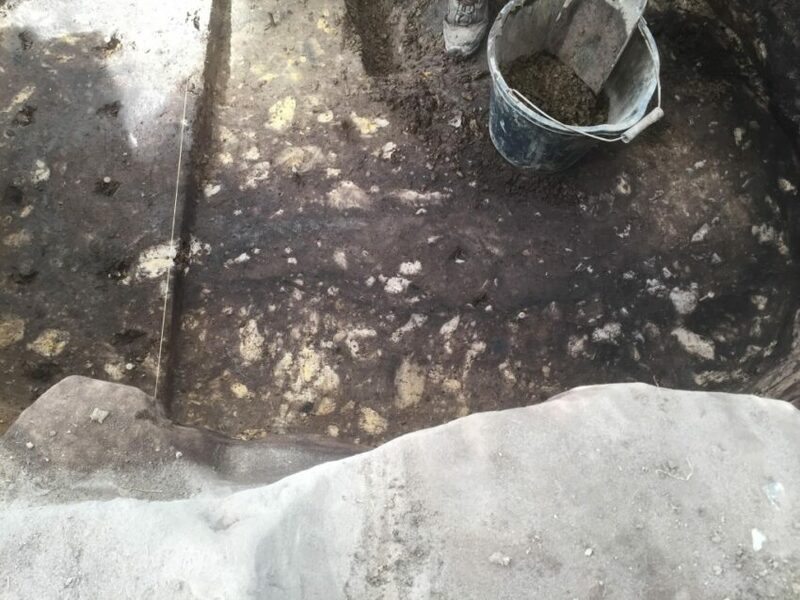 We think the darker horizontal stripe in this pit in Barrow 19 is a coffin. 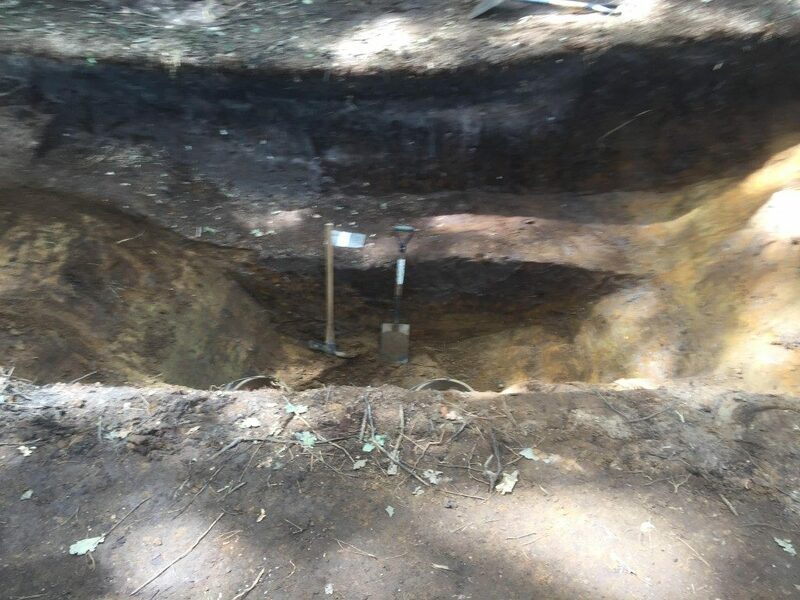 While the team has only uncovered the top of the possible-coffin remains here, who knows what they will find as they delve deeper over the next few days?